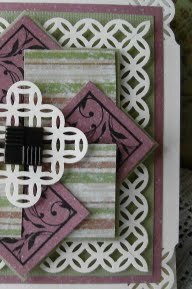 Vada's Blog Stamp Inks and Paper : Lacy Pinwheel Mini Card. 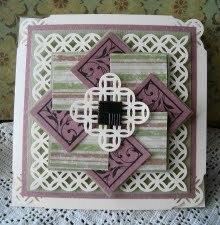 From the currant newsletter (August 2010) I made this mini (4 ½ x 4 ½”) card using the Pinwheel TQ. The punch is from Martha Stewart, (Modern Garland), both corner punch and broader punch. The only stamp I used is from Inkadinkado. Close Up of Lace work. Love your card Vada. I also have that punch and like the way you did the card using it. Thank's for sharing. OOOOh Vada, this is a lovely card, I hadn't thought about a pin wheel card in years. Love the punch. very pretty Vada, nice technique!